Audubon’s Important Bird Areas (IBAs) Program is a global effort to identify and protect sites that are critical for the conservation of birds. An IBA may be under public or private ownership, or even a combination of both. The aim is to develop a network of private land owners, public agencies, community groups, and local Audubon chapters that will work to ensure that IBAs are managed and preserved for the benefit of the important bird populations they serve. The Montana Audubon website has more information about the IBA program and about the sites currently designated as IBAs. Audubon has identified three IBAs in the Flathead drainage: Glacier National Park, Owen Sowerwine Natural Area and North Shore of Flathead Lake. All are open to the public, with some restrictions. Links below provide directions and access information. Glacier Park IBA has recorded more than 275 species of birds. Fourteen nesting species are of conservation concern, including Olive-sided Flycatcher, Peregrine Falcon, Brewer’s Sparrow, and Cassin’s Finch. Glacier Park is Montana’s only known nesting area for Northern Hawk Owls, and one of only a handful of nesting sites for this species in all the lower 48 states. It is one of the best places in the state to find nesting Harlequin Ducks and White-tailed Ptarmigan. The Glacier National Park website provides a wide range of information about the Park; included is a section on the birds of Glacier. Owen Sowerwine IBA is an outstanding example of undisturbed riparian bottomland forest and shrubland situated just east of Kalispell in the braided section of the Flathead River, where the Stillwater and Flathead Rivers merge. It is open to the public for low impact recreation such as walking, bird watching, fishing, boating, and hunting, and is frequently used by local teachers for nature education. More than 125 species of birds have been recorded in the area. Old-growth cottonwoods attract tree-nesting waterfowl, such as Wood Ducks and Hooded Mergansers. The ungrazed understory supports a representative community of riparian shrubland birds, including Yellow Warbler, American Redstart, and Black-chinned Hummingbirds. Tree canopy nesters include Black-headed Grosbeaks and Bullock’s Orioles. Hollow snags provide roosting and nesting sites for large numbers of Vaux’s Swifts. Ospreys, Great Blue Herons and Bald Eagles also nest here. The Area is a 442-acre parcel of Montana School Trust Land that is jointly managed by the Flathead Audubon Society and Montana Audubon under a license from the Montana Department of Natural Resources and Conservation. On this website you’ll find more information about OSNA, including a list of OSNA bird species. North Shore IBA encompasses more than 3600 acres of public and private lands, and includes 7 miles of high quality shoreline, wetlands, and adjoining uplands that support a high number and wide diversity of resident, migratory, and wintering birds. More than 220 bird species have been observed here. 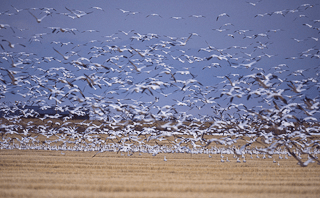 The area is an important refueling stop for tens of thousands of Central and Pacific migratory birds with Northern Pintail, American Wigeon, Tundra Swan, and Canada Goose being the most common. Offshore habitats are important overwintering areas for up to 2,000 mixed diving ducks each year (Redhead, Canvasback, Greater and Lesser Scaup), as well as both Tundra and Trumpeter Swans. Hundreds of shorebirds per day feed on the shore during spring migration, and it is a major staging and roosting area for gulls during both spring and fall migration – up to 5,000 per day. Four Bald Eagle nesting territories lie along the shore. This IBA includes two publicly-owned tracts. The Flathead Lake Waterfowl Production Area (1,887 acres, administered by the U.S. Fish and Wildlife Service) covers much of the lake shore and its associated wetland habitats. The North Shore State Park (70 acres, administered by Montana Fish, Wildlife, and Parks), is located just east of the Waterfowl Production Area, near the Eagle Bend/Bigfork communities. Both are open to the public from July 16 through the end of February; the closure from March 1 through July 15 is for the protection of migratory and nesting birds. The National Audubon website has further information about the North Shore IBA, and here, on this site, is a list of North Shore IBA bird species.